This month’s selection of cool tech toys is all about robots. What could be a better way how to get someone interested in robotics and engineering than a fun, smartphone-controlled toy robot? But don’t let the word “toy” mislead you. The robots featured on this list are more complex than computers from the pre-internet era. This allows kids to keep discovering new ways how to play with them, learn with them, and, ultimately, grow with them. 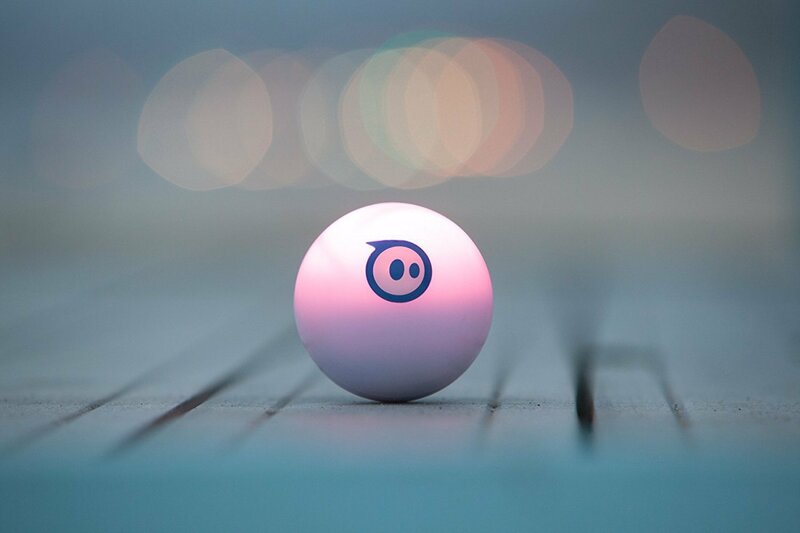 The Sphero is an app-controlled ball that can reach speeds of up to 7 feet per second or about 7.6 km per hour. The official app, available for Android and iOS, is used to control the ball, upgrade its firmware, and customize its settings. It can also turn any place into a video game thanks to its augmented reality capabilities. Compared to the previous version, the Sphero 2.0 is 3-times brighter, which helps to find it when playing outside and also cranks up the fun-factor to 11 when using Sphero at night. Its high-impact polycarbonate shell can withstand a lot of abuse, and the built-in Bluetooth transmitter boasts a range of up to 100 ft. At around $130, this little toy is guaranteed to see a lot of use. Get it here. Clearly inspired by WALL-E, Cozmo is a cute robot powered by an artificial intelligence engine capable of real interactions with the world and the people around it. Cozmo relies on computer vision to recognize faces and objects, and its little wheels help him explore. Even though Cozmo is packed with complicated electronic circuits and advanced technologies, the simple Android and iOS app makes it suitable even for fairly young children. The app comes with many activities, and users can unlock more as they play with Cozmo. That most likely won’t take a long time because this beeping fella doesn’t hesitate to express that it wants to play. For $169, you get Cozmo, a charger, and 3 Power Cubes for the robot to play with. Get it here. The Ozobot 2.0 Bit is the latest version of a programmable robot designed to get children interested in programming and robotics. The robot can recognize colors and color sequences on paper and digital displays of Android and iOS tablets and smartphones. Different color combinations are used to tell the Ozobot to do different things. You can chain colors together to make the robot race around a course, dance to the beat of a song, or fight other Ozobots in an arena. The Ozobot is what you make it. Thanks to the excellent app for Android and iOS, you’re guaranteed to enjoy a lot of good fun as soon as you unpack the two Ozobots that come together in a bundle for $110. Get it here. The 4M Doodling Robot is deceptively simple and surprisingly fun toy. It relies on a vibrating motor that causes it to spin around and create works of art. You can equip the robot with different pens and pencils, and adjust their angle and height. The robot runs on a single AA battery, and absolutely no special knowledge is needed to use it. Along with the simplicity of this innovative toy goes an excellent price of just $15.99. Unlike with many other cool tech toys, you don’t need to be afraid that it will get damaged by the tiny hands of your curious children. Get it here. Zoomer starts at around $250, and the price includes the robot itself and everything you need to use it. Get it here.